Hope all the dads out there had a nice Father’s Day yesterday. After church, we (my husband, our son, and I) went to Qdobas to eat lunch after church. I received a coupon by email from them on Friday saying, “Bring this coupon AND Dad in to Qdobas for a free entree for Dad with the purchase of another entree.” That is such a good deal, and since we really like Qdobas, that’s where we went. By the way, if you would like to sign up to get freebies and discounts ever so often by email then here’s where you can sign up for a Qdobas Reward Card. 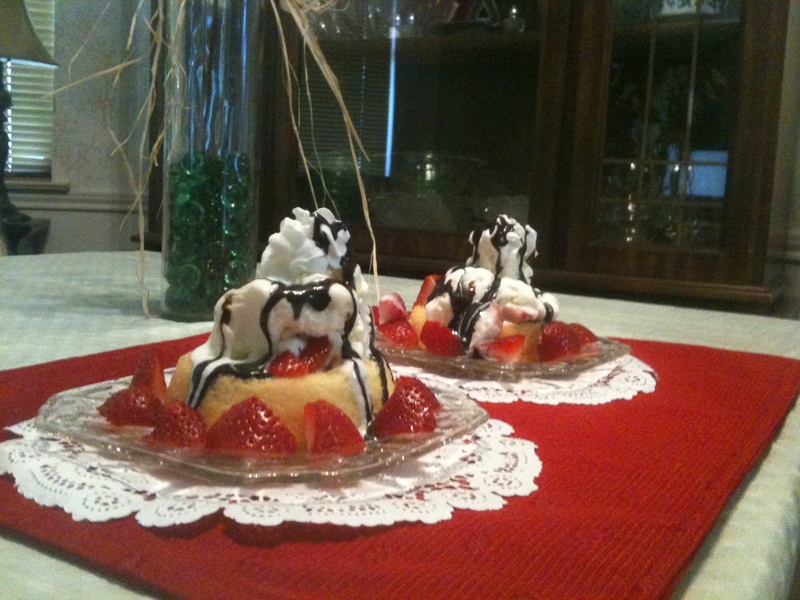 Place shortcake cup on a pretty plate. Cut strawberries in half and place around base of shortcake. Top with frozen yogurt and top with whipped cream. Drizzle chocolate syrup on top. Place plate on top of a paper doilie for a fancy looking dessert that’s so simple.